The socio-historical reading of the hadith does not seem to have been adequately studied, so the study of hadiths to find the authenticity of the text and its precise meaning is still to be considered, this consideration is due to the very rapid development of contemporary society, to the extent of requiring a review of the process a meaning maqasid hadith, it is certainly to emphasize the view of hadith as the foundation of Islamic law which put forward various aspects, hermeneutics of hadith as a science that reflects the text of hadith in recording the history of the past, then understood existentially in the present situation need to be moved, in order to achieve interpretation which is close to the truth. This is because the hadiths have been formed in the time of the Prophet, while the post-life of the Prophet has continued to develop, so that life is now required to adapt to that source, as the textual understanding of talak will lead to an understanding that tends to position women as parties who get a very disadvantaged position, again under any circumstances if a husband has said the word "talak", then a divorce is a necessity, whether a husband is conscious or unconscious. So this concept is very discriminative, contextual re-understanding of the traditions that explain about the talak sirri need to be peeled back, in order to know how the context and terms of legal and formal registration of divorce to be understood in the current era. Imam, R. Haryono dan C. Varhaak. Filsafat Ilmu pengetahuan: Telaah Cara Kerja Ilmu-ilmu. Jakarta: Gramedia Pustaka Utama. 1991. Lidwa Pustaka Hadis 9 Imam. Nuruddin, Amiur dan Azhari Akmal Tarigan. Hukum Perdata Islam di Indonesia: Studi Kritis Perkembangan Hukum Islam dari Fikih, UU No. 1/1974 Sampai KHI. Jakarta: Kencana. 2006. Najwah, Nurun. Ilmu Ma’anil Hadis, Metode Pemahaman Hadis Nabi: Teori dan Aplikasi. Yogyakarta: Cahaya Pustaka. 2008. _____________dkk. Dilema Perempuan Dalam Lintas Agama dan Budaya.Yogyakarta: PSW UIN SUKA dan IISEP CIDA. 2005. _______________. Perempuan Dalam Pernikahan (Tela’ah Ulang Wacana Keagamaan). Yogyakarta: TH Press. 2008. Zayd, Nasr Hamid Abu. Hermeneutika Inklusif: Mengatasi Problematika Bacaan dan Cara-Cara Pentakwilan atas Diskursus Keagamaan, terj. M. Mansur dan Khoiron Nahdhiyin. Jakarta: ICIP. 2004. MAULANA, Luthfi. Telaah Ulang Talak Sirri Melalui Hermeneutika Nurun Najwah. 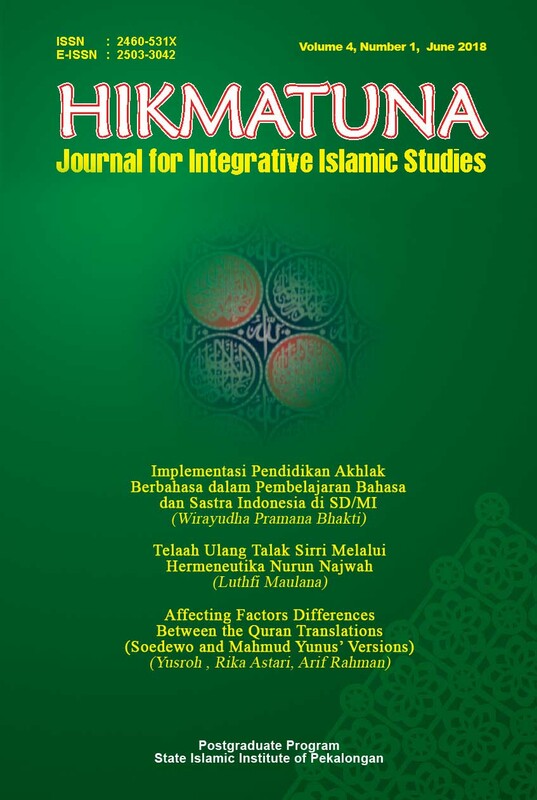 HIKMATUNA : Journal for Integrative Islamic Studies, [S.l. ], v. 4, n. 1, p. 53-76, june 2018. ISSN 2503-3042. Available at: <http://e-journal.iainpekalongan.ac.id/index.php/hikmatuna/article/view/1269>. Date accessed: 22 apr. 2019. doi: https://doi.org/10.28918/hikmatuna.v4i1.1269.